A solid night for NBC. NBC: The season premiere of AMERICA’S GOT TALENT held the 2.6 from 2016’s premiere, a real accomplishment these days. The premiere of WORLD OF DANCE was very compatible at 2.4, a much higher number than the 1.5 for last year’s MAYA & MARTY premiere that followed AGT. FOX: The season finale of PRISON BREAK rose 0.2 from last week to 0.9. The night began with a 0.5 LETHAL WEAPON rerun. 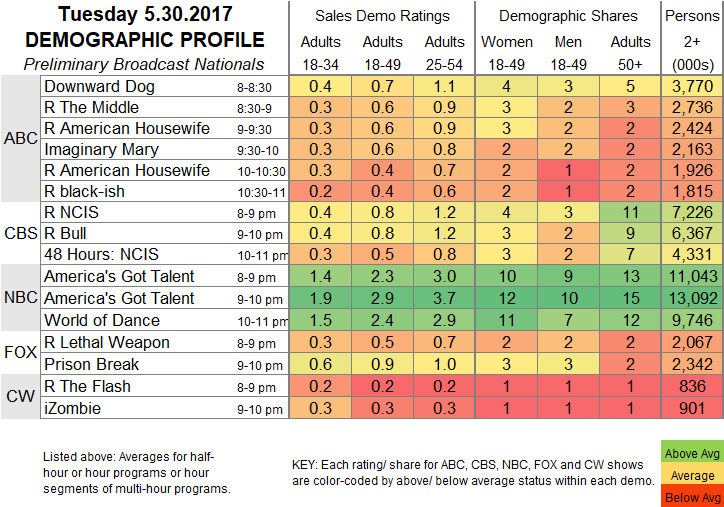 ABC: DOWNWARD DOG, airing for the first time without strong company from a season finale (MODERN FAMILY and then DANCING WITH THE STARS) slumped by 0.3 to 0.7. After a pair of 0.6 sitcom reruns, IMAGINARY MARY dropped 0.2 to 0.6, and two more 0.4 sitcom reruns filled the 10PM hour. CW: IZOMBIE stayed at last week’s 0.3, which was sort of impressive given that its lead-in plummeted from last week’s 1.1 for the season finale of THE FLASH to last night’s 0.2 for a FLASH rerun. 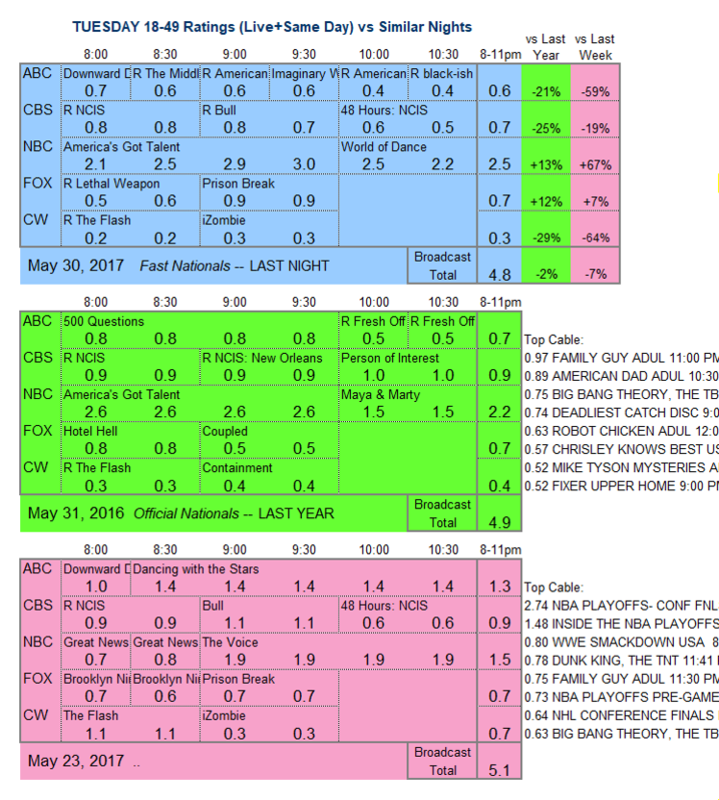 CBS: After a pair of 0.8 procedurals, 48 HOURS: NCIS slipped 0.1 to 0.5. Summer launches continue tonight, with the long-awaited return of NBC’s THE CARMICHAEL SHOW, MASTERCHEF and THE F WORD on FOX, and BIG STAR LITTLE STAR on USA. CABLE RATINGS: Come back this Thursday morning for detailed demographic ratings for top Tuesday cable programs from this day, later than normal due to Memorial Day.